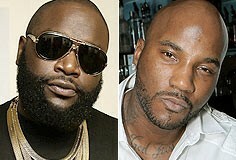 *It’s being reported that rappers Rick Ross and Young Jeezy got into a scrap Saturday night backstage at the BET Hip Hop Awards in Atlanta. In fact, Hot 107.9 (Atlanta) air personality DJ Drama was an eyewitness to the incident and below, takes time out of his show to recount what went down. Supposedly after the altercation, shots were fired outside of the event, but so far there has been no confirmation or arrest. They always act a fool at the black shows, but they are chior boys at the Grammy’s or American Music Awards.